2. Refer to the exhibit. A network administrator is configuring access control to switch SW1. If the administrator has already logged into a Telnet session on the switch, which password is needed to access privileged EXEC mode? 4. What must be configured to enable Cisco Express Forwarding (CEF) on most Cisco devices that perform Layer 3 switching? Manually configure next-hop Layer 2 addresses. Issue the no shutdown command on routed ports. CEF is enabled by default, so no configuration is necessary. Manually map Layer 2 addresses to Layer 3 addresses to populate the forwarding information base (FIB). 5. 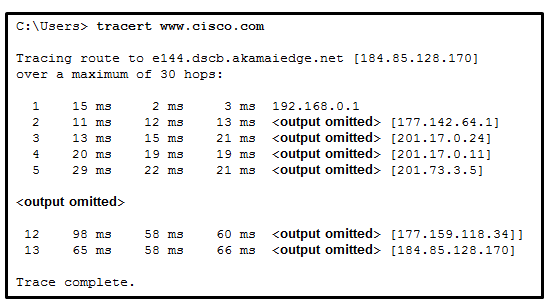 What is the purpose of adjacency tables as used in Cisco Express Forwarding (CEF)? 6. Which statement describes a characteristic of the network layer in the OSI model? It manages the data transport between the processes running on each host. In the encapsulation process, it adds source and destination port numbers to the IP header. When a packet arrives at the destination host, its IP header is checked by the network layer to determine where the packet has to be routed. Its protocols specify the packet structure and processing used to carry the data from one host to another. 7. A user gets an IP address of 192.168.0.1 from the company network administrator. A friend of the user at a different company gets the same IP address on another PC. How can two PCs use the same IP address and still reach the Internet, send and receive email, and search the web? Both users must be using the same Internet Service Provider. ISPs use Network Address Translation to change a user IP address into an address that can be used on the Internet. ISPs use Domain Name Service to change a user IP address into a public IP address that can be used on the Internet. Both users must be on the same network. 8. At a minimum, which address is required on IPv6-enabled interfaces? 9. Why does HTTP use TCP as the transport layer protocol? 10. What is the binary representation of 0xCA? 11. What is the valid most compressed format possible of the IPv6 address 2001:0DB8:0000:AB00:0000:0000:0000:1234? 13. What field content is used by ICMPv6 to determine that a packet has expired? 14. Which statement is true about variable-length subnet masking? 15. Which firewall technique blocks incoming packets unless they are responses to internal requests? 16. A network technician is investigating network connectivity from a PC to a remote host with the address 10.1.1.5. Which command issued on the PC will return to the technician the complete path to the remote host? 19. What is a possible hazard that can be caused by network cables in a fire? The cable insulation could be flammable. Users could be exposed to excessive voltage. Network cables could be exposed to water. The network cable could explode. 20. What device is commonly used to verify a UTP cable? 21. What needs to be checked when testing a UTP network cable? 22. Refer to the exhibit. A ping to PC2 is issued from PC0, PC1, and PC3 in this exact order. Which MAC addresses will be contained in the S1 MAC address table that is associated with the Fa0/1 port? 23. Which function is provided by TCP? 24. What does a router use to determine where to send data it receives from the network? 25. Which router interface should be used for direct remote access to the router via a modem? 26. A technician is configuring a router to allow for all forms of management access. As part of each different type of access, the technician is trying to type the command login. Which configuration mode should be entered to do this task? 28. Refer to the exhibit. A TCP segment from a server has been captured by Wireshark, which is running on a host. What acknowledgement number will the host return for the TCP segment that has been received? 29. Which statement is true about an interface that is configured with the IPv6 address command? A global unicast IPv6 address is dynamically configured on the interface. 30. Refer to the exhibit. The network administrator for a small advertising company has chosen to use the 192.168.5.96/27 network for internal LAN addressing. As shown in the exhibit, a static IP address is assigned to the company web server. However, the web server cannot access the Internet. The administrator verifies that local workstations with IP addresses that are assigned by a DHCP server can access the Internet, and the web server is able to ping local workstations. Which component is incorrectly configured? 31. Refer to the exhibit. An administrator must send a message to everyone on the router A network. What is the broadcast address for network 172.16.16.0/22? 32. A network administrator is variably subnetting a given block of IPv4 addresses. Which combination of network addresses and prefix lengths will make the most efficient use of addresses when the need is for 2 subnets capable of supporting 10 hosts and 1 subnet that can support 6 hosts? 33. How many additional bits should be borrowed from a /26 subnet mask in order to create subnets for WAN links that need only 2 useable addresses? 34. Fill in the blank. A (logical, LOGICAL) topology influences the type of network framing and media access control that will be used. Unauthorized individuals can connect to the router via Telnet without entering a password. Because the IOS includes the login command on the vty lines by default, access to the device via Telnet will require authentication. Access to the vty lines will not be allowed via Telnet by anyone. Because the login command was omitted, the password cisco command is not applied to the vty lines. 36. An administrator issued the service password-encryption command to apply encryption to the passwords configured for enable password, vty, and console lines. What will be the consequences if the administrator later issues the no service password-encryption command? It will remove encryption from all passwords. It will not reverse any encryption. It will reverse only the enable password encryption. 37. After making configuration changes, a network administrator issues a copy running-config startup-config command in a Cisco switch. What is the result of issuing this command? Data sent with a service that uses TCP is received in the order the data was sent. A port is considered to be open when it has an active server application that is assigned to it. An individual server can have two services that are assigned to the same port number. An individual server cannot have multiple services running at the same time. Server security can be improved by closing ports that are associated with unused services. 41. Why does a Layer 3 device perform the ANDing process on a destination IP address and subnet mask? 42. Given the binary address of 11101100 00010001 00001100 00001010, which address does this represent in dotted decimal format? 43. A particular telnet site does not appear to be responding on a Windows 7 computer. What command could the technician use to show any cached DNS entries for this web page? 44. Fill in the blank. Network devices come in two physical configurations. Devices that have expansion slots that provide the flexibility to add new modules have a (Modular, modular) configuration. Refer to the exhibit. 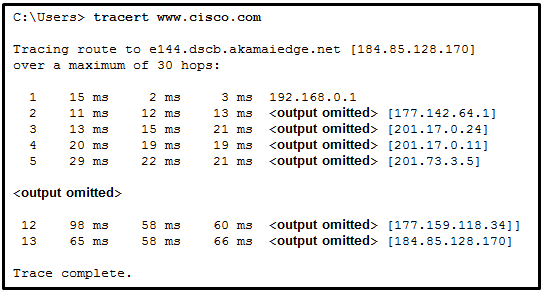 What is the maximum TIL value that is used to reach the destination http://www.cisco.com? 46. 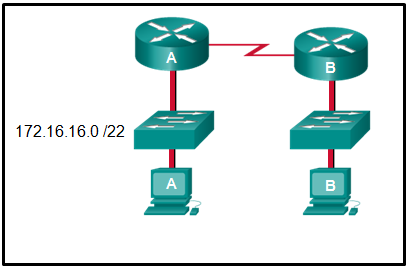 Which statement is true about DHCP operation? When a device that is configured to use DHCP boots, the client broadcasts a DHCPDISCOVER message to identify any available DHCP servers on the networK. A client must wait for lease expiration before it sends another DHCPREOUEST message. 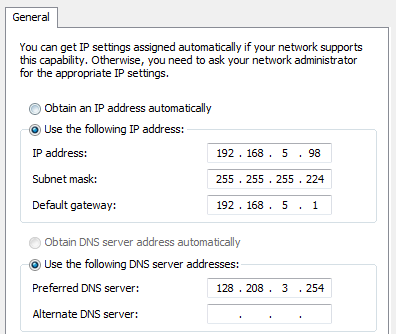 The DHCPDISCOVER message contains the IP address and sub net masK to be assigned, the IP address of the DNS server, and the IP address of the default gateway. If the client receives several DHCPOFFER messages from different servers, it sends a unicast DHCPREOUEST message to the server from which it chooses to obtain the IP information. 47. Which type of wireless security is easily compromised? 49. A host PC is attempting to lease an address through DHCP. What message is sent by the server to the client know it is able to use the provided IP information? 50. A network administrator is configuring access control to switch SW1. If the administrator uses console line to connect to the switch, which password is needed to access user EXEC mode? 51. What is a characteristic of UTP cabling? 52. How many bits would need to be borrowed if a network admin were given the IP addressing scheme of 172.16.0.0/16 and needed no more than 16 subnet with equal number of hosts?